Apple has had pretty much its own way in the tablet computer market with the iPad, but today, with Google’s announcement of the Google Nexus 7 tablet, the game is about to get very competitive. In opposition to the iPad, Google has chosen the 7 inch form factor, rather than the iPad’s 10 inch screen. I think that’s a good thing. For one, it’s a point of difference with the iPad. Secondly, being smaller would have some bearing on the price. And on price, Google has come (back) into the game very strongly. The price of the Nexus 7 is 8GB model is $249, while the 16GB model is $299. Lastly, regarding form factor, I think there’s been an object with us for quite some time that points to this size as ideal, or comfortable – the paperback novel (I note in the video below they allude to the paperback… it’s something I’ve though since my time with the Samsung 7 inch tablet a couple of years ago). In great news regarding the Nexus 7, Australia is one of four countries Google has chosen for an initial launch, the others being the US, UK, and Canada. It is available for pre-order now from the Google Play site, with a delivery of mid-July. 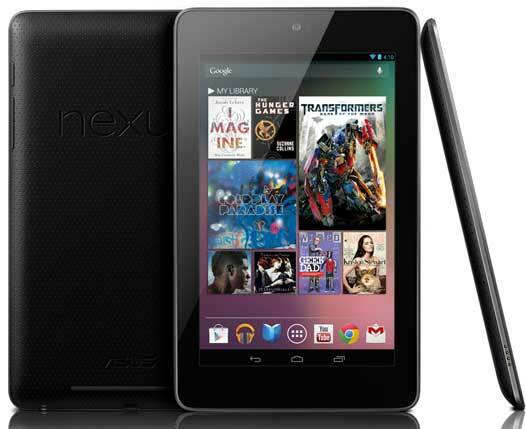 Click the thumbnails to go to the Nexus 7 image gallery, and view larger images of the device. Now, what other specs are on the Nexus 7. First, it’s running an all-new version of Android, version 4.1. or to give it the ol’ Android ‘sweet’ name, it is Android Jelly Bean. The CPU is a Quad-core Tegra 3 processor, the 1Gb of RAM, and the battery is 4325 mAh, providing “up to” 8 hours of active use). The aforementioned screen is a 1280×800 HD display (216 ppi), back-lit, and protected by scratch-resistant Corning glass. It measures 198.5 x 120 x 10.45mm, and weighs 340 grams. This short video from Google shows off the main features of the Nexus 7, along with some of Android Jelly Bean’s new tricks. So what do you think? Will the Google Nexus 7 be THE device that really takes on Apple’s iPad – scroll down to the Leave a Reply section with your comments. The Tablet looks amazing but I would like to see one for real. Do you sell them from shops? Hi Denise. I’m not a store – I may link to an online store, but I don’t sell things myself. I imagine there will be a few retailers stocking the Nexus 7 when it lands.